There are several essential life and death patterns that quite commonly occur in games, however can be quite tricky to master. I think knowledge and familiarity with many of them are vital (necessary but not sufficient) for becoming stronger (reaching shodan and beyond). If you’ve never heard of patterns like L groups, L+1, L+2, J groups, J+1, tripod, notcher, long L, door group, hovercraft, carpenter’s square, etc, and you are a DDK working toward SDK, or even an SDK working toward dan, then I think the below linked resources are valuable. 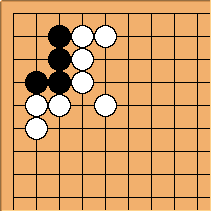 You could also figure out a lot of these patterns on your own by solving enough tsumego, but I think at least for some, systematic study could be beneficial. There are definitely many other great resources, but here are a few that I know about and found to be helpful. In particular, see the “Corner Shapes” and “Side Shapes” sections. James Davies wrote a nice book called simply “Life and Death”. Each chapter focuses on a pattern or concept, spends a couple of pages discussing it, and then provides about six problems to further explain and explore variations. Thank you 1001 times, @yebellz. P.S. : Take a look at Jasiek’s First Life and Death. How about once a week I post in this thread one of the corner patterns, linking the Sensei’s library page and some problems to consider, and then we (for anyone that’s interested in participating) read the materials and work through understanding the pattern and problems together? I’ll start this with my next post in this thread (either later today or tomorrow, to give me some time to gather materials), with the first topic being the “L group”. Alright, let’s kick off this study group by looking at the L-group, which I think is a good place to start, since this pattern is very fundamental to understanding and evaluating other patterns. Ah-oh. I’m in trouble. I have learnt this one in this past… and then forgotten it… and then learnt it… and then forgotten it again. So when it comes up in games I am working it out fresh each time, though I’m confident I usually get it right. Is it called the ‘L-group’ because of how it looks in this configuration? Yes, I believe it’s called the L group because it looks like an L in that orientation. The basic thing to remember is that black is dead even if it is his turn to play. You don’t have to memorize every response to black’s futile attempts to live, but just practice related problems enough that you can read it out during a game. It is fundamental since some related groups can be reduced into an L group in order to kill. As the defender, you need to avoid being reduced to this dead shape.